This is a recipe I used from dessertfirstgirl's blog. Macaroons are a cookie I have made multiple times and am still mastering them. However, I did master the ones I made in school (probably because I had all of the right equipment, which I don't have at home. One of the hardest "make do's" for these at home is the scale. I recommend that if you have an electronic scale, use it, because an ordinary scale probably set off my ounce measurements. Despite my scale, warped pans, and a piping bag made from a gallon sized freezer bag, I managed to make good macaroons. They were a little more crumbly than I had hoped, but I'm still coming back for seconds, along with everyone else I gave a taste. Plus, my favorite part about homemade macaroons is that on the rare occasion that I do find them available for purchase, they are sold for $2.00 each, while I just made a batch of 50 with an ingredient cost of $7.00. Like I said, it is rare that I find a bakery that sells macaroons, but if you are in Southern California, there is a cute store/tea salon, Paris in a Cup, located in Orange Circle. I recently had lunch there, along with 2 macaroons to-go. Italian style (sucre cuit) macaroons are made of almond flour (At home, I use blanched almonds and grind them myself), egg whites, granulated sugar, and powdered sugar, and food coloring. The filling is commonly buttercream or ganache, which is possible for me to do, but I love jam so I stick with berry preserves. There are certain tools that you will need no matter what, including: a candy thermometer and a mixer with a whisk attachment. Italian style french macaroons are made by adding a cooked sugar syrup of 245 degrees into a meringue at stiff peak and beating until the meringue is cooled and at 70 degrees. Then, the meringue mixture can be flavored and/or colored, and folded into the almond, powdered sugar, and egg white mixture. The macaroons are piped with a round tip onto parchment paper and left to rest, which allows the meringue to dry out, and contain the inside of the macaroon so they don't crack in the oven. 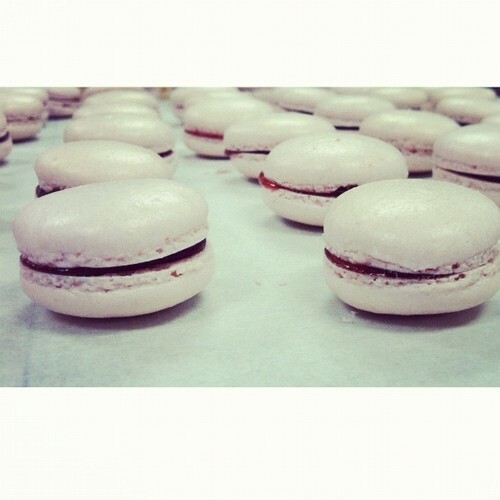 The macaroons are baked double panned, in the center of the oven so they can "pop up" or technically, develop feet. After the macaroons are cooled, they are completed by sandwiching them together with a filling. Temperature and timing are the most important factors to watch out for when baking these treats. two portions of 1.8 oz. egg whites at room temp. 1. If using whole almonds, grind them in a food processor. 2. Process confectioners sugar with the almonds. 3. Sift the almond/sugar mixture into a bowl. 4. Put egg whites into a mixing bowl fitted with a whisk attachment to prepare for meringue. 5. Combine granulated sugar and water into a small pot. 6. Over medium high heat, stir the sugar and water until mixture comes to a boil, do not stir any longer. 7. Use a candy thermometer to take the temperature of the sugar while using a pastry brush dipped into a cup of water to wash the crystalizing sugar from the sides of the pot. 8. When the sugar reaches 237 degrees, start to whip egg whites on high speed. 9. When the sugar reaches 245 degrees, the egg whites should be at stiff peak. Remove sugar from heat and turn the mixer down to low speed. 10. In a slow, steady, pencil-like stream, pour the cooked sugar into the whipping egg whites, taking care not to let the sugar touch the whip or the side of the pot. 11. Turn the mixer back up to high speed and beat until cooled and the meringue reaches 70 degrees. 12. Add flavoring and/or food coloring. 13. Add unbeaten egg whites to the almond/powdered sugar mixture and fold gently. 14. Quickly add italian meringue to almond mixture and fold, do not overmix! 15. Put the macaroon mixture into a piping bag fitted with a medium round tip and pipe onto pre-prepared sheet pans lined with parchment paper. *when piping, you want each round to be exactly alike. Normally, I apply even pressure while counting 3 seconds. I like to rest the piping bag on the pan and squeeze the mixture out, then quickly curl the tip when the three seconds are up. *pipe from the middle of the sheet pan to the outside of the pan to avoid reaching over the already piped macaroons. 16. Allow the piped macaroons to set for about 30 minutes or until they do not stick to your finger when touched. 17. Bake double panned in the middle of a pre-heated 320 degree oven for about 7-9 minutes. *baking any cookies double panned prevents them from browning on the bottoms before the inside of the cookie is done. 18. Remove from oven when the pan is shaken and the cookies slightly move from their place on the parchment paper. Do not allow the cookies to brown or change color at all. If they begin to, take them out of the oven. They are done. 19. Let cookies cool before removing from pan. 20. Sandwich cookies together with your choice of filling. 1. Over a double broiler, heat egg whites to 90 degrees. 2. In a bowl with a rubber spatula, mix almond meal, sugar, and 90 degree egg whites to a paste. Set aside. 3. In saucepan, heat water and granulated sugar (do not stir after it comes to a boil, brush the sides of the pot with water to prevent crystallization of sugar). 4. When sugar hits 238 degrees, begin to whip the egg whites. 5. When sugar hits 245 degrees, stream pencil thin into whipping egg whites, whip until cool. 6. Remove from mixer and fold in food coloring. 7. In 3 stages, fold the meringue into the paste. 8. Pipe macaroon batter (with an 803 round tip) onto a sheet pan lined with parchment. 9. Bake double panned in a preheated 320 degree oven, do not allow cookies to brown at all. 10. Remove from oven and let cool completely. Sandwich with your choice of filling. Professional recipe developer / food writer / photographer / cake decorator. Based in Park City, UT. Visit Jessica Bose's profile on Pinterest.